The Book, Verses and Chapters help people find specific parts of the whole Bible. The first book of the bible is called the Genesis, which has around 50 chapters. Each chapter is filled with amazing stories. The Bible is the story of creation. God created the world in six days and rested on the seventh. He got everything into existence except the humans. Then He formed man from the dust of the ground and woman from the rib of the man. 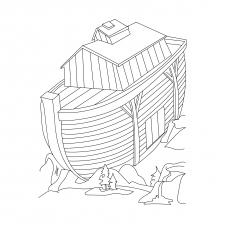 God wanted Noah to preach and persuade people to repent their sins and save themselves from the coming flood by entering the ark. 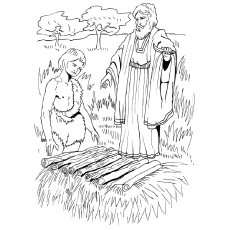 However, when the flood came, no one came to board the boat, except Noah and his family. 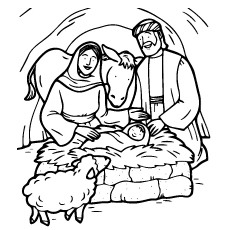 Joseph was the favorite of this his father Jacob. One day, Jacob presented Joseph a beautiful multi-colored coat. 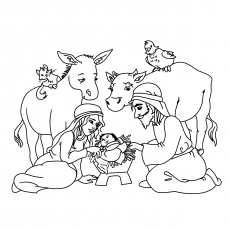 His brothers were extremely jealous seeing their father give the coat to Joseph. His brothers then devised a plan to kill Joseph. However, instead of killing him, they sold him into slavery. He took the coat, tore it up and dipped in the blood to show that Joseph had been eaten by a wild animal. However, Moses ended up growing up in the family of Pharaoh. While Moses was away from Egypt, God appeared in the form of a burning bush. He told him to return to the Pharaoh and lead the people of God to the Promised Land. The children of Israel were ready to possess the land that God had promised to them. The only obstacle in their way was the great walled city of Jericho. God then appeared to Joshua and told him to destroy the city. He told Joshua to walk around the city of Jericho one time a day for six days. On the seventh day, they would walk around the city seven times. 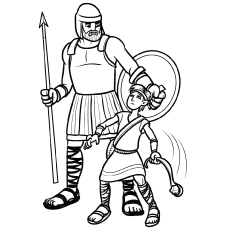 The story begins when Goliath, a giant from the Philistine army challenges the Israelites for a duel. David was only a young boy at the time of the war. Yet he agreed to fight Goliath. David fought Goliath, not with sword, bow or arrow, but with a sling and rocks. Johan tried to escape God’s plan by fleeing on a ship. 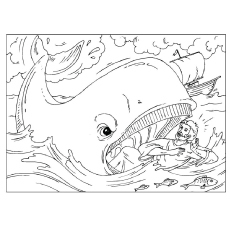 However, Jonah was thrown overboard and was then swallowed by a huge fish. He then prayed to God to forgive him for running away. Later, the fish spit him out on the shoreline. Jonah then finally obeyed God’s command to preach repentance to the people of Assyria. 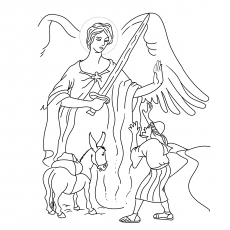 It is said that an angel appeared to Mary to tell her that she was going to have a baby even though she was not married. Mary trusted the angel’s words and Child Jesus was born. The baby inside her was once promised to Adam and Eve in the Garden of Eden. The people were tired and hungry, so Jesus asked his disciples how they would feed so many people. 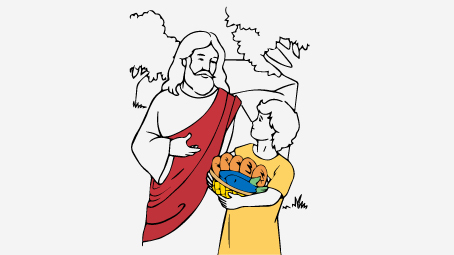 The disciples looked around and found a boy with a lunch. He had some bread and fish. Jesus took the lunch and prayed over it. He then broke the bread and fish and gave it to each of his disciples. Everybody got as much to eat, as they wanted. The disciples tried hard to make it to the shore. Then, Jesus came walking across the water to help them. Peter then wanted to walk on water just like Jesus. Things started well for him, but the moment he took his eyes off Jesus, he began to sink. 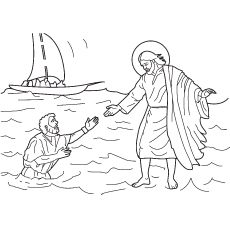 Just then, Jesus lifted him up and brought him back to the boat. 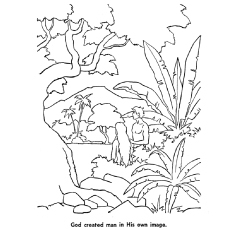 According to the Bible, Adam and Eve were the first man and woman. They were led astray by a snake that tempted them to taste the Forbidden Apple of Knowledge. It is said that God created human beings to live in the Paradise, but they fell away from the state and formed the word full of suffering and injustice. Samson is believed to be one of the strongest persons of all time. It is said that he killed a lion with his bare hands and killed 1000 Philistines with a jawbone of a donkey. Samson was a member of the tribe of Dan. He was one of the Judges of Israel and judged for 20 years. 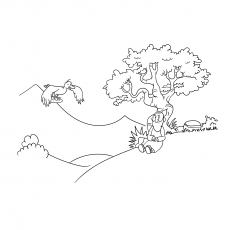 This coloring sheet shows Elijah being fed by a raven. Elijah was a prophet and a wonder worker in the kingdom of Israel. After Elijah’s confrontation with Ahab, God tells him to leave Israel and take refuge in the brook Chorath, where he would be fed by the ravens. 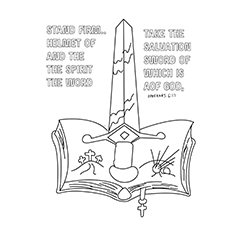 The Sword of the Spirit is the word of God. 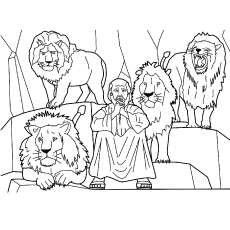 This coloring sheet will teach your children how we can win battles as soldiers of the Lord. The letters are opened enough to let your child color comfortably. The sword can be silver, gray, gold or any color your child likes. According to the Bible, the Israelites wanted to worship something in the absence of Moses. 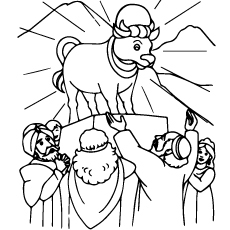 Hence, Aaron made a golden calf idol for the people of Israel. Moses, upon seeing the calf, became all angry and threw the Tablets of Stone, breaking them. Daniel was an official in the Persian Empire under King Darius. Darius had made a decree that no one can offer prayers to God except him for a period of thirty days. Daniel did no pay any heed to him and continued to pray. For this reason, Daniel was thrown into a lion’s den. However, he was unharmed and was released the following morning. God had decided to test Abraham’s faith by asking him to sacrifice his son. Abraham loved God so much that he agreed to sacrifice his son for him. As soon as he raised his hand to sacrifice his son, God cried out to him to leave Isaac and sacrifice the ram caught in the bush. The woman is described as a wealthy married woman with no child. The woman took permission from her husband to set up a guest room for Elisha. God rewards her kindness by giving her a son. Later, the son dies and God raises him though Elisha. It is represented by a Roman soldier’s helmet, without which one could never enter battle. 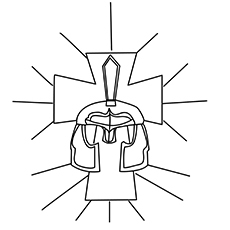 The purpose of the helmet was to protect from the dangerous arms commonly used in the warfare of those days. 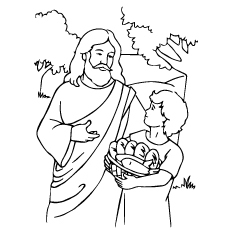 This coloring sheet will teach your child that salvation defines the attitude and spirit. 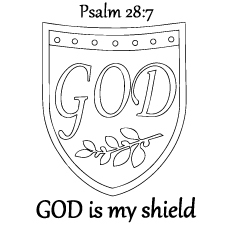 The Shield of Faith was used to protect the spiritual lives in the middle of the physical trials. 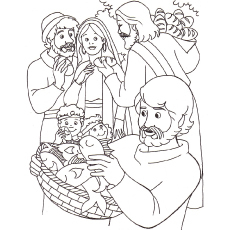 This coloring sheet is a great way to help your child develop a deep and secure faith. The burning bush is believed to be located in Mount Horeb. The bush was on fire, but was not consumed by the flames; hence, it is called the burning bush. God appeared to Moses in the form of a burning bush and told him to help the Israelites reach the Promised Land. 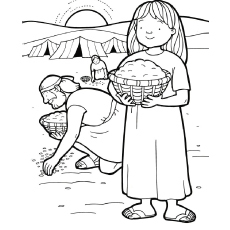 This coloring sheet depicts a little girl gathering manna. Manna, also known as manna, is an edible substance that according to Bible was provided for the Israelites during their travels in the desert. 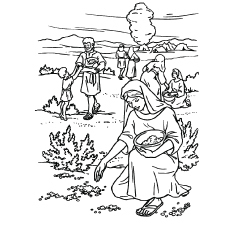 Manna is treated as a natural, but unique substance created during the twilight of the sixth day of creation. 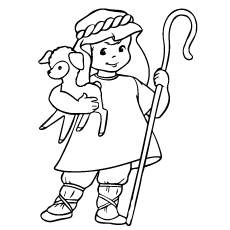 Cain is described as a farmer and Abel as a shepherd, as you can see in the picture. Cain was the first human to be born and Abel was the first human to die. Cain committed the first murder by killing his brother out of jealousy and anger. Divine judgment was passed upon Sodom and Gomorrah, which resulted in the cities being completely destroyed by fire and brimstone. The coloring sheet shows people trying to save their lives from the fire. 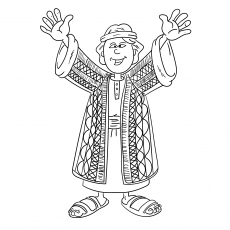 This coloring sheet features Balak and Balaam. 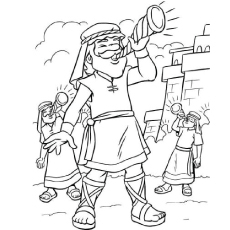 The story of Balak and Balaam occurs during the sojourn of the Israelites in the Moab plains. The Israelites had defeated the two kings on the side of the Jordon.